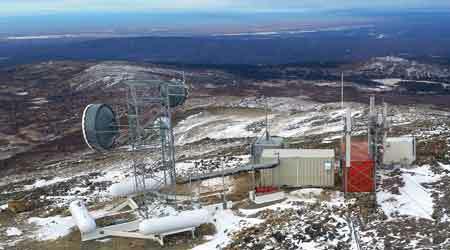 Alaska Railroad completed a new communication site on Bald Mountain in 2016. Photo – Alaska Railroad Corp.
Major C&S projects planned in 2018: For fiscal-year 2018, continue PTC projects on the Empire Corridor and Springfield Line. Major C&S projects planned in 2018: Install duct bank, OCS, RH and signals on North Metro Line in Denver, Commerce City, Thornton and Northglenn, Colo., 12.5 miles; and work on parking garage, duct bank, OCS, traction power substations (TPSS), RH and signals for Southeast Rail Extension in Lone Tree, Colo., 2.3 miles. In addition, begin to revamp the signal system to include automatic train control (ATC), expect to finish in 5 years. Major C&S projects planned in 2018: Installing an ACSES PTC system across entire network, $400 million; installing cab signaling on the Port Jervis Line (Suffern to Port Jervis), complete by mid-2020, $73 million; new cab signal system with PTC for Waterbury Branch that has no signal system now, 27 miles, complete by Dec. 2020, $108 million; replace signal system on the New Haven Line, milepost 29 to 43, complete by 2021, $88 million; cable replacement on Upper Hudson (express fiber, communications and power cables), milepost 35 to 75; and fiber cable upgrade (express fiber and communications cables) on the Harlem Line, milepost 12 to 53. Major C&S projects planned in 2018: New and ongoing projects include PTC, $126 million; centralized train control, $20 million; and normal signal replacement, $30 million. Major C&S projects planned in 2018: As part of first phase of 10-mile BART/VTA Silicon Valley extension, replace legacy Westinghouse multiplex speed encoding system with NS MUX microprocessor-based multiplex speed encoding system at specific locations; upgrade legacy train-control system to communications-based train control ($1.15 billion); and rebuild train control. Major C&S projects planned in 2018: Ongoing PTC installation and testing. Major C&S projects planned in 2018: Upgrade the Metro Green Line train-control systems, $4,667,000. Major C&S projects planned in 2018: Supervisory control and data acquisition (SCADA) upgrade to update train control and power rooms with state-of-the-art electrical components and enhanced troubleshooting ability, $168 million, to end in FY2019. 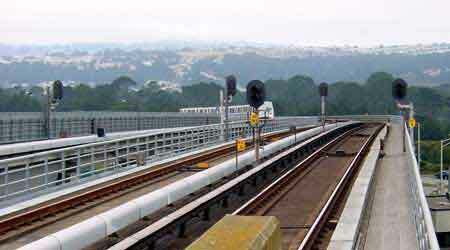 In the early 2000s, a BART train approached signals on an aerial structure in San Francisco. Major C&S projects planned in 2018: Rehab grade crossing predictor units and gate mechanisms in Orange Subdivision (Orange County Line, south of Orange Station); and rehab signal system logic controllers in San Gabriel Subdivision (San Bernardino Line). Total cost for projects is $4 million. Also, obtained a $10.5 million grant from the California State Transportation Agency in February to help modernize signals and track. The $16.3 million project calls for replacing aging mechanical signals with electrical units, installing new switches and crossovers, and upgrading track infrastructure near Los Angeles Union Station. Major C&S projects planned in 2018: High-visibility pavement markings, $2 million; interline OCS motor-operated disconnects, $1 million, and fining in FY2018; install switch upgrades at Fannin and Sunset; and install battery upgrades for C&S signal house cabinets along the Red Line. Major C&S projects planned in 2018: Signal upgrades at priority locations, $2.3 million; and install an automatic train control system crossover at West Portal, a multiyear project, $5 million. Major C&S projects planned in 2018: Substation equipment replacement, $2.5 million; center tower relocation to Lindenwold Shop, $1.3 million; Lindenwold Shop DC power upgrade, $1 million; complete upgrade of center tower SCADA software, $600,000; back-up generators installation, $593,000; and camera and parking lot entry gate rewiring, $561,000. Major C&S projects planned in 2018: Communications SCADA control system upgrade, $3.6 million; two-way radio purchase, $304,000; communications house rehab — SS and phase 1, $109,000; and SIG battery backup replacement for phase 1, $210,000. Major C&S projects planned in 2018: Train-to-wayside communications system upgrade, $800,000; Guadalupe signal/SCADA system replacement, about $700,000; SCADA/Geisys software upgrade, $500,000; CAD-AVL update, $500,000; LR Ring communications equipment upgrade, $300,000; and SCADA/TVM separation, $300,000. Major C&S projects planned in 2018: Upgrade computers for fare vending machine, $520,000. Major C&S projects planned in 2018: Installing a 1500-foot siding with power switches as part of signals project, $1.3 million, should start in October and be completed by December; also, Amtrak has received TIGER VII funding to improve a segment between Lamy and Madrid, N.M, that involves replacing the signal system, a damaged culvert, and half a mile of track with a slide fence and warning signal, $16 million, work also to be done in Colorado, Kansas and New Mexico. Major C&S projects planned in 2018: PTC implementation on the commuter railroad is substantially complete. Have initiated a multi-year program to install PTC on the Media/Sharon Hill suburban trolley lines. As part of the resiliency program, are reinforcing the signal power system for the Chestnut Hill West, West Trenton and Warminster lines, and the Doylestown Branch of the commuter railroad. Major C&S projects planned in 2018: Continue upgrading Ravenswood Connector signal system, which is 40 years old, $32.6 million, work began in late 2016 and is projected to conclude in late 2018. Coupled with a $90 million track and infrastructure renewal project completed in the area in winter 2015, the signal upgrade will support safer, faster and more reliable rail service. Major C&S projects planned in 2018: Continue to post progress on PTC implementation in the DFW subdivision and propose to be in revenue service demonstration in late 2018. Major C&S projects planned in 2018: Catenary replacement on 6.5 miles in LaPorte County, Indiana, $2 million.